The Cassini-Huygens mission concludes in late 2017, with the spacecraft repeatedly diving through the space between Saturn and its rings during its final year. Only a handful of close flybys of Saturn’s large, icy moons remain for the spacecraft, according to NASA. Cassini is scheduled to make three approaches to the geologically active moon Enceladus on Oct. 14 and 28, and Dec. 19, passing just 30 miles from its surface on Oct. 28. NASA explained, “Cassini will make its deepest-ever dive through the moon’s plume of icy spray at this time, collecting valuable data about what’s going on beneath the surface.” The space agency said, After December there are a handful of distant flybys planned for Saturn’s large, icy moons at ranges of less than about 30,000 miles. 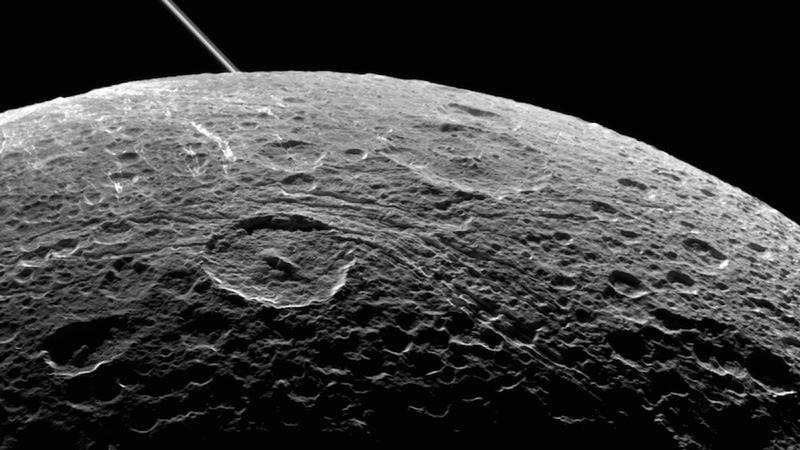 The Dione pictures are the latest in a series of a stunning space images. One-year astronaut Scott Kelly took an incredible aurora picture from the International Space Station last week and India’s Mars orbiter recently captured beautiful 3D images of the red planet. Cassini passed 295 miles above Dione’s surface at 2:33 p.m. ET on Aug. 17, its fifth close encounter with Saturn’s icy moon. The spacecraft, which has been exploring Saturn and its moons since 2004, made its closest-ever Dione flyby in Dec. 2011 when it passed within 60 miles of the moon’s surface.